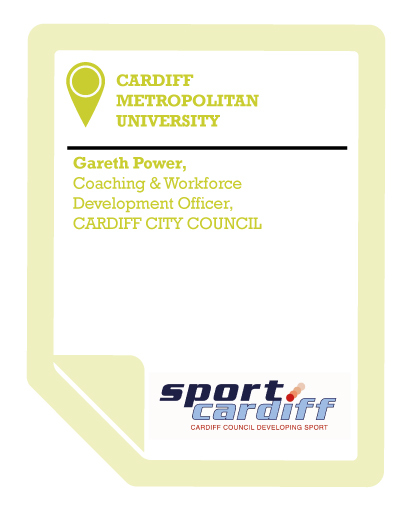 Sport Cardiff is Cardiff Council’s sports development department. As a department we develop sports development activities across the city, through schools, sports clubs and community projects. Cardiff Metropolitan University (CMU) has a strong sporting heritage and reputation as a university that offer lots of sport-related degrees and courses. There has always been a strong relationship between CMU and Sport Cardiff. The University part funds our coaching and workforce programme, which is a help to us, but on a practical level we’re also invited to different university events – fresher fairs, presenting in lectures and talking to students about volunteering opportunities. If we advertise for a student placement we have helpful contacts at the University who can get information out to students. I love seeing how the work experience we offer helps students to secure a great job after university. For example, a recent student went straight into employment with a national governing body of sport. They stood out as a candidate because they had both the academic and practical experience, gained through Cardiff Metropolitan University and our placement opportunities. CMU asks for feedback and evaluation on the students we take on placement and are very supportive. They are aware that they want their students to add value to what we do and are very keen to support us to make this happen. The student population in Cardiff is pretty significant and a lot of the students there possess coaching qualifications. To be able to tap into that student population benefits our programmes and we can get access to great coaches to add value to our programmes. Cardiff Metropolitan University is an excellent university and very keen to ensure that their students are getting valuable industry-based experience. The student workforce that they offer can bring significant benefits to any organisation or company.